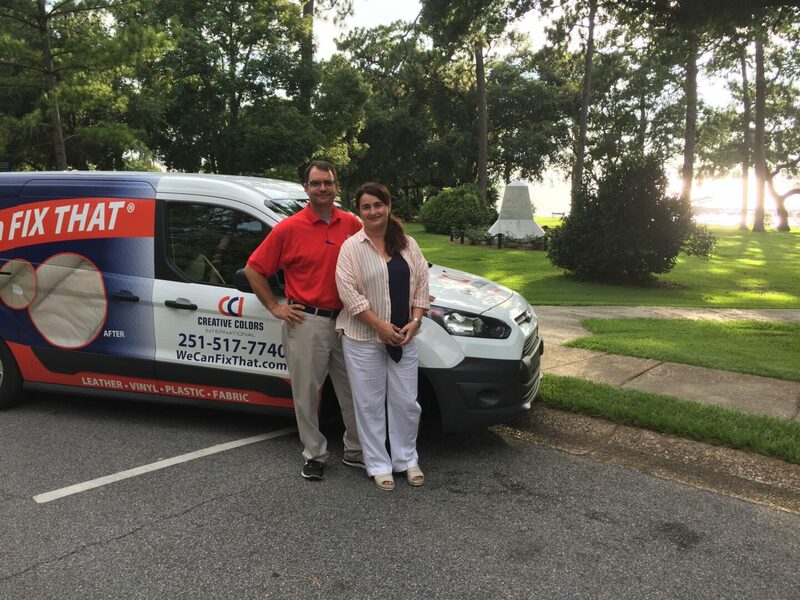 (Fairhope, Alabama – July 2nd, 2018) – Creative Colors International (CCI), the nation’s leading on-site repair and restoration franchise, launched its newest location June 25, on the eastern shoreline of Mobile Bay in Fairhope, Alabama. This is big news, as more local business owners and cost-conscious residents than ever before are seeking out alternatives to astronomical upholstering charges and replacement fees associated with damaged possessions that are made of leather, vinyl, plastic and fabric. Husband and wife team Paul and Jennifer Batchelder have chosen Baldwin County and the beautiful shores of South Alabama to open their new business and start a new chapter in their lives. Jennifer is a South Mississippi, native, and although Paul grew up in Upstate New York, he went to school at the United States Sports Academy in Daphne twenty-eight years ago and has never forgotten the allure of the deep south. The opportunity to open a Creative Colors International franchise is also a great fit for the Batchelders. Paul worked 27 years in college athletics and Jennifer has honed her skills, creativity and expertise within the restaurant industry and event management arena. The couple accumulated decades of experience in marketing, business development, customer service, and building relationships. With Creative Colors International, they will be able to bring all their skill sets and expertise together to build a successful business of their own. The Batchelders chose to become CCI owners for two primary reasons – the great products and service training that is provided by the family-owned business based out of Chicago and the reasonable start-up costs with the potential to scale into something bigger. The statistics suggest that repairing and restoring, as opposed to upholstering and replacing, can save local business owners and residents hundreds of dollars on any damaged item. For example, the costs associated with upholstering any type of seat can be very steep, ranging anywhere from $120 to $450 per cushion. And according to Terri Sniegolski, Creative Colors International’s CEO, the commitment shared by all franchisees to help customers save up to 90 percent in replacement fees by repairing worn and/or damaged materials and deliver on the company’s “We Can Fix That” philosophy, has been the key catalyst for the company’s expansion to 82 locations in 28 states with 160+ mobile units since its initial inception in 1980. The Batchelders are also strong believers in community involvement and volunteerism and are ready to get deeply engaged in their new hometown. For more information on the Batchelders and their Creative Colors International location, please visit https://www.wecanfixthat.com/south-alabama/.